Nicole couldn’t be happier to be making her debut with Kokandy Productions alongside this amazing cast and creative team. 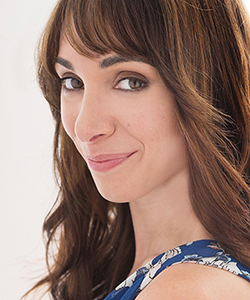 Since arriving from New York, Nicole has worked at The Marriott Theatre (Cinderella After the Ball u/s), Goodman (Another Word for Beauty, workshop), Oil Lamp Theater (Motherhood Out Loud). In September, she will be debuting The Death and Life of Billy The Kid; a multi medium folk opera created by Seth Bockley and Frank Maugeri. Before coming to Chicago, Nicole performed the role of “Lisa” in the Broadway National Tour of Mamma Mia! A graduate of NYU’s Tisch School of the Arts, she also composes and plays original music. You can find her songs at NicoleLmusic.com. All her love to Jamie, who she first wandered the streets of New York with years ago, and who she is blessed to wander everywhere with today.